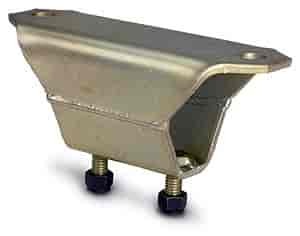 This soild transmission mount is made from rugged 3/16'' steel with pre-welded studs and yellow chromate finish. It replaces the soft, stock rubber mount to eliminate linkage binding, driveline misalignment and unwanted transmission movement in racing and street performance. It is manufactured with a computer-controlled process that insures a precise fit and alignment for easy installation.